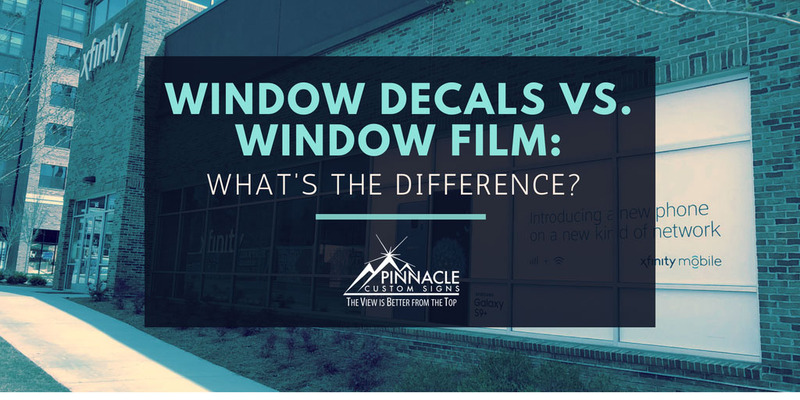 What is the difference between window decals and window film? Window Decals vs. Window Film: What’s the difference? 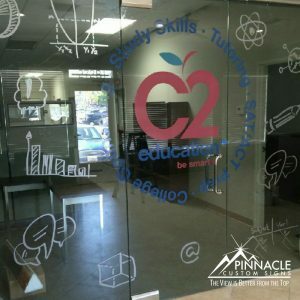 Window Graphics are one of the most popular forms of marketing, branding, and advertising for many businesses. 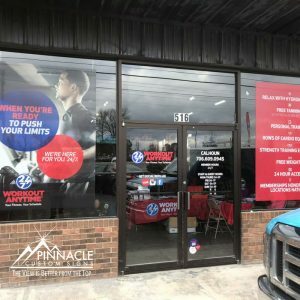 Window graphics can allow for the business to change out their message frequently or create a permanent message about products or values for anyone who passes by to see. The large uninhibited window spaces found on almost all brick and mortar locations is why window advertisement never goes out of fashion. Vinyl window cling material can be pasted on the inside to allow you to see-through the window or even outside in fair climates. The material can help promote your business with customized graphics that can come in many shapes, sizes, and colors. Various forms of vinyl window applications have their pros and cons. The two most commonly used forms are clear static window clings and perforated window vinyl film. Window Cling Decals are basically a sticker with a design on it which can be installed on the window. It will be just like a printed paper, but it sticks to the window and advertises whatever you want. These are semi-permanent in nature and can be easily replaced. They can be installed on the inside or the outside of the building. The decals can be clear see-through material or come in an opaque form. Static clings designs are great for short-term signage (less than 6 months), such as temporary promotions and branding. Clings can also be used for personal events, such as weddings. The see-through vinyl window subtrate can be hard to see from a faraway distance. Opaque materials block the natural light and view from inside. These types of graphics are not very weather resistant, and their location needs to factor weather conditions into the decision process. The perforated vinyl film that forms the vinyl window stickers allows one-way visibility either from inside or outside. It makes this format the ideal window signage. This type of graphic is applied on the side of the window that you want it to be seen. Outside messages are applied to the outside while inside messages are applied inside. Perforated window signs can be custom designed according to the client’s needs and desire for visibility. 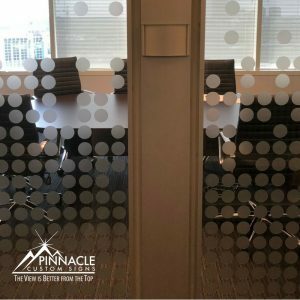 Custom perforated window decals are one of our most popular items since they are affordable and are perfect for front-facing businesses to market their message. This type of signage can act as a way to market your message and act as a privacy film to prevent people from peeping in your windows. It shows well from far off distances without any trouble. This vinyl window film also lasts a long time and is weather resistant, because they can withstand the elements, including UV rays and rain. These can be placed on almost any type of surface. Vinyl decals can also be produced with unique options such as lettering, shapes, inside glass, double-sided and clear vinyl. The film comes in many options to create unique displays such as being able to light up at night or mix many colors. Perforated vinyl window film costs more than a simple window decal. The film also blocks natural light from entering a business, so its location and light blocking should be considered when selecting it as the marketing method. Both sets of window graphics have their own advantages depending on the need of the client. At Pinnacle, we work with many clients who have different needs. Maybe you simply want to use window clings as promotional products to use on the back of cars, maybe you need to create large messages to promote seasonal sales, or you might quite simply want to jazz up your conference room glass. Regardless of your why, we can help. Give us a call and let us help you maximize your clear spaces. You are here: Home / Business Signage / Window Decals vs. Window Film: What’s the difference?